RSK Geophysics. Mapping the unscene. The deployment of the latest equipment, coupled with the field application of the latest processing and visualisation software can provide key information not available through other means. 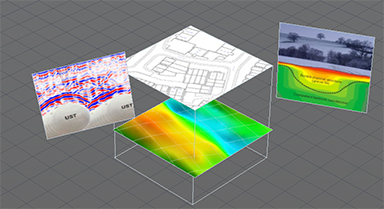 Geophysical surveying techniques provide a toolbox of rapid, discrete and cost effective methods for the location and identification of subsurface features. We have established ourselves as one of the UKs leading geophysical consultancy practises outside of the natural resources sector. As part of RSK, the Geophysics Group provides expertise, survey design and site investigation services. We routinely apply state of the art geophysical instrumentation to the identification of subsurface variations associated with man-made and natural phenomena. Our senior staff have international research profiles through their work in geophysical data collection and interpretation, with work ongoing into new equipment and data processing software.